Hong Kong is one of those places in Asia that we've never aspired to visit but were pleasantly surprised by. As the first stop of our month long trip to Asia, we were blown away by Hong Kong during our one-week stay. Known for its vibrant street food scene, bustling markets, and diverse culture, Hong Kong is a hotspot for tourists from all over the world. Visiting in the spring meant that Hong Kong was warm, yet overcast with relatively cool temperatures for its tropical climate. It ended up being our most tolerable climate of the 5 countries in Asia we visited during our month long trip. We have so many stories and travel tips from our recent trip but we wanted to start by introducing this magical place in the form of pictures. Here our are favorite travel photos to inspire you to visit Hong Kong. Hong Kong is a bustling, busy city that is definitely worth exploring. It was the very first place we visited during our month-long trip to Asia, and we had a one week Hong Kong travel itinerary. As we tried to figure out what to do in Hong Kong and where to stay, we realized the importance of knowing the main neighborhoods of the area. This, along with your budget and timeframe, will help you choose the best accommodations to suit your travel needs. Thanks to a well-connected MRT train system, it is pretty cheap and easy to get around Hong Kong via public transit. Below is the Hong Kong MRT System Map, but please be sure to check their website for the latest version. If you prefer taxis, they are ample and also decently affordable for getting around town. With a populated of more than 7 million people, space is limited in Hong Kong. Whether you opt for a budget trip or have a bigger budget to play with, you'll likely face tight accommodations. Below, you'll find suggested hotels, hostels, and accommodations for each major neighborhood. This is the financial district of Hong Kong known simply as Central. It is on the north shore of Hong Kong island, located across the way from Tsim Sha Tsui.Walk the many winding streets of Central such as Gage Street, Graham Street, and Aberdeen Street to see many distinct, official-looking skyscrapers. Many of the world's top financial institutions have offices in Central, so you will see many professionals frequent the area by day. There are also many small wet markets and stalls where locals sell trinkets and traditional Hong Kong foods. At night, Central is a great place to dine out in style, frequent bars, or go out to the many nightclubs that are full of energy every night of the week. Since Central is close to the popular spots of Lan Kwai Fong and Victoria Peak, it is a very desirable place for most tourists to stay in Hong Kong. One of Hong Kong's major shopping districts, Causeway Bay and Wan Chai are where you go for shopping at name-brand stores from around the world. Despite being a largely commercial district, Causeway Bay and Wan Chai are very centrally located. It is very easy to catch a taxi or MRT to another neighborhood. For accommodations, Wan Chai has more Airbnb rentals and slightly cheaper hotels than in Causeway Bay. For young people desiring hip and trendy areas, Causeway Bay and Wan Chai are where to stay in Hong Kong. Located in the northwestern part of Hong Kong Island, Sai Ying Pun is one of the oldest areas in the city. A recent revitalization brought an extension of the MTR line to Sai Ying Pun. As a result, many new restaurants, cafes, and shops have sprouted between the older storefronts and wet markets. The newer construction has made the area very popular among hipsters. While the neighborhood is very liveable, it may be a bit low-key for tourists. However, very nice hotel rooms with great views of Kowloon and Victoria Harbor can be booked here for much cheaper than over on Tsim Sha Tsui. Located at the base of Kowloon, Tsim Sha Tsui is another popular spot for tourists visiting Hong Kong. It is very close to Victoria Harbor, where you can get stunning views of the city skyline. Tourist attractions are centered mainly on the shopping streets of Nathan Road and Canton Road. Tsim Sha Tsui doesn't have the young, party vibe of Central and Causeway Bay. However, it is a quick MRT ride away from these popular districts. This convenience along with the fact that the highest concentration of hotels in Hong Kong is in Tsim Sha Tsui make this the ideal location for accommodations. Here you can find everything from big-name international hotel chains or budget hostels. Not far from Tsim Sha Tsui is the highly dense area of Mong Kok. There are many bars, nightclubs, and massage parlors here, but most tourists are drawn to Mong Kok for its food and shopping markets. This is where you can find cheap knockoffs, trinkets, souvenirs, and everything on your travel shopping list. If you are seeking cheap hotels, Mong Kok is where to stay in Hong Kong for the most affordable options. Have you visited Hong Kong before? Let us know any advice you may have about where to stay in Hong Kong! Despite the relative expensiveness of Hong Kong, there are plenty of cheap or free things to do in Hong Kong. In fact, taking a long walk around the city with no particular destination in mind often led to beautiful parks and gardens, and even a free zoo and aviary. Many of the city's sightseeing attractions are free, and getting to them via a taxi or the metro is very affordable. Between the MRT metro and incredibly cheap local taxis, Hong Kong is can be traversed very easily and affordably. There are also many walkways and paths throughout the city, so it is easy to traverse by foot. Perhaps the biggest initial challenge is getting from the Hong Kong International Airport to the city center (Central) since they are located about 25 miles apart. The quickest cheapest way to get into Hong Kong from the airport is to take the Airport Express train. It leaves directly from inside the airport and connects to Hong Kong's larger metro station layout. It's about $100 Hong Kong dollars ($12 USD) for a one-way ticket, and trains run every 10 minutes. Another option is to catch a taxi from the airport to your final destination, which can cost $200-300 Hong Kong dollars ($25-39 USD). Spanning 2,600 feet at an elevation of 443 feet from top to bottom, the Central-Mid-Levels escalator in Hong Kong is the world's longest outdoor covered escalator. It was constructed in 1993 with the intent of helping commuters get around the city. Today it is also a tourist attraction and a practical solution for traversing some of the incredibly steep hills. Hong Kong's loud party zone is Lan Kwai Fong. Located in the heart of the Central Business District, Lan Kwai Fong's roads are blocked off and locals and tourists alike emerge to party the night away. The busiest nights by far are Friday and Saturday. Featuring cobble-stoned streets, the area is full of trendy restaurants, bars, and nightclubs, surrounded by the city's nearby skyscrapers. While bars will charge quite a bit for cocktails and booze, it's perfectly acceptable to get cheap drinks at 7-Eleven and drink in the streets. In fact, that's probably one of the cheapest and easiest ways to socialize and really experience the full party scene at Lan Kwai Fong. Located next to Lan Kwai Fong, Soho is the main entertainment district of Hong Kong, featuring an array of hip and diverse eateries and bars, all contained within colonial architecture. It's also the hipster area of town, full of Western food and drink options including craft beer from Oregon! Curious about other foodie hotspots in town? Check out the Hong Kong Food Guide for ideas and recommendations. A very distinct marker on the harborfront is the flashy ferris wheel. Fun to take photos of and a ride as well if you're willing to shell out for the ticket. Hike up by foot for free, or pay to get up quicker via tram. Go up for sunset and stick around until around 7:00 pm to see the city come alive with the nightly light show. Word of caution: if the weather is overly foggy, hold off and visit on a clear day. The whole point of Victoria Peak is to enjoy the expansive city view, so a foggy day will be a waste. Nestled in the south corner of Hong Kong Park, is a large 32,000 square foot walk-through aviary. Free to the public, the aviary houses 600 birds that are indigenous to Southeast Asia, Indonesia, and New Guinea. Named after one of the city's late governors, Edward Youde Aviary is considered the largest aviary in Southeast Asia. Located on the peninsula north of Hong Kong Island, Kowloon is one of the most densely populated places in the world. However, compared to Soho and the rest of "downtown" Hong Kong, Kowloon feels less chaotic and much more livable. Two key areas of Kowloon include the budget hotel district of Tsim Sha Tsui and the shopping markets of Mong Kok. Hop aboard a public bus or take a taxi about 30 minutes south of downtown Hong Kong and you'll find yourself in a cluster of urban beaches. This urban retreat features modern shopping malls and dining facilities. There are also outdoor recreation areas including a designated swim areas and even an outdoor golf course. While Hong Kong is indeed a crazy concrete jungle, it also has its fair share of nature hikes. One of the most scenic and relatively easy hikes begins at Parkview and ends at Wilson Trail Stage One. It's an incredibly scenic hike with stunning views of Hong Kong and Repulse Bay. Unfortunately, the weather was foggy on the day of our hike, so we did not get a clear view. To get to Parkview, take bus 6 or 61 from Exchange Square Terminus in Central to Wong Nai Chung Gap. Or you can simply take a taxi directly to Parkview. Share your favorite things to do in Hong Kong in the comments below! Hong Kong is a truly incredible city that is definitely worth putting on your travel bucket list. In December 2015, Martin made a sudden business trip to Hong Kong, and he returned to Seattle raving about the sci-fi city. After viewing his photos from the trip, we decided to make Hong Kong the first destination on our month-long trip to Asia a few months later. Below is our Hong Kong travel itinerary for a one-week trip, along with our thoughts on visiting this interesting Asian city. Hong Kong was the very first destination on our tour of Asia throughout the month of April. We flew direct from Seattle to Hong Kong on Delta Airlines at a steal of an airfare price and immediately set about exploring the area on our first day in. Why Hong Kong? Martin had been sent here on a business trip in December and came back raving about the bustling activity, built up infrastructure, and overall high level of business activity in the region. While there were certainly many tourist attractions in Hong Kong that we frequented, the objective was to experience Hong Kong living as a local to see if it was a city we'd like to return to at a later date. The answer? Tiny living spaces and high humidity aside, absolutely! First Day: Arrive in Hong Kong International Airport. Check into Airbnb rental in Central Hong Kong. Spend the day exploring Central by foot. Second Day: Day trip to Kowloon and Mong Kok. Third Day: Work day in Central with a hike up to Victoria Peak at sunset. Fourth Day: Hike and day trip to Repulse Bay. Days 5-7: Overnight trip to explore Macau. Hong Kong is easily the most expensive city we visited. Hotels were on the spendy side, averaging at least $100 USD per night. Hostels were also on the spendy side between $15-40 USD per night. Since we wanted to experience Hong Kong from a local's perspective, we opted for a private Airbnb rental. Although spendy, Airbnb apartments granted us access to an entire living space. This sounded great in theory but disappointing in reality. It turns out Hong Kong living spaces are indeed very expensive and tiny, so this may affect your overall Hong Kong travel itinerary. Cheap food could definitely be found in Hong Kong, but eating out at hip Westernized restaurants was pricey. Cocktails were also spendy, averaging $15-20 USD per drink, and even abundant hookah bongs were in the $40 USD range. For comparison, hookah in Bali only cost $5 USD for the same quality. Despite the extravagant pricing, transportation was very cheap, making it an easy decision to take taxis around town. We were startled at the wide number of women camping out on the sidewalks of the city. They were splayed out on cardboard boxes in large groups, engaged in various activities from braiding each others' hair, reading books, sharing meals and bottles of wine, and just socializing with each other. After inquiring on Google, we discovered that these women weren't homeless, but instead housemaids. Being mostly of Filipina descent, they work six days a week and have Sundays and holidays off. Since they tend to live either in the houses the work in or in dorms, they have no place to gather and socialize, so they take to the streets, with the permission of the Hong Kong government to do so. There is always an incredible display of hustle and bustle throughout the streets at (almost) all hours of the day. Hong Kong is truly a city that never sleeps and is fittingly dubbed the "New York of Asia." If you're looking for an active nightlife scene, be sure to make it a part of your Hong Kong travel itinerary. Hong Kong's demographics are diverse and varied consisting of high-rolling professionals (usually in banking or finance), international expats of young and old, and native Hong Kongese residents. Seeing these groups of people clash was a puzzling sight and was always apparent in the party areas of Soho and Lan Kwai Fong. It wasn't unusual to pass a raucously drunk crowd of street party-goers being watched warily by old Hong Kongese grandmas sweeping, cleaning and gathering the piles of booze bottles that accumulated streetside every night. The streets of Hong Kong were filled mostly with taxis and very few personal cars. Most Hong Kongese get around by taxi or public transit. The personally owned vehicles we did see were mostly shiny new Tesla, Lamborghini, Porsche, or some other extremely high-end sports car. More often than not, the stunning vehicle was manned by a 20-year-old millionaire. Despite not being as shiny new and clean as Singapore, Hong Kong had a penchant for cleanliness and order in other ways. Every public space and bathroom had a cleaning attendant on hand along with signs declaring how often the area was sanitized daily. All public restrooms were spotless with ample soap and tissues and no charge to use. There were also frequent signs urging denizens to wear a surgical mask if they had any signs of illness. "Our wardrobe at home is bigger than this bathroom!" Those are words you never want to utter, especially when inspecting an apartment that you'll be spending the next 4 days in. To my utter horror and dismay, those were the exact words that came out of my mouth when I first stepped into the Hong Kong Airbnb apartment that Martin had booked us. Wanting to experience life like a local and thinking that an apartment rental would include more space than a hotel, we opted for an Airbnb experience. We ended up in a 130 square foot studio apartment in the bustling entertainment area of Central Hong Kong, known as Soho. Located near the top of the famous Central-Mid-Levels escalator, Soho was full of restaurants, bars and nightclubs galore, making it our ideal home base for our first few days in Hong Kong. Unfortunately, living like a true HongKongese local also came with the acceptance of living in an incredibly tiny living space. The most difficult room to comprehend was the tiny closet of a bathroom and shower room. It was so small and narrow that even my 5' 3" frame could barely turn around or bend over in. Thus, you should be prepared for tight and cozy living quarters whether you opt for Airbnb or a hotel. As a kid, I got in my possession a vintage keychain photo of my parents in a Hong Kong restaurant. Originally taken in 70's, that keychain has been a favorite of mine throughout the years of adulthood. It immediately came to mind when we started planning this trip. Thus, that same restaurant in Kowloon was among the main priorities of our Hong Hong Travel itinerary. Pretty cool to see that La Taverna is still standing! Our week of traveling in Hong Kong made us fall in love with this unique Asian city. We wouldn't hesitate to return in heartbeat, whether for business, pleasure, or both. What do you think of our Hong Kong travel itinerary? Let us know in the comments below! I must confess, I love casinos like the ones in Las Vegas. Even though I don't drink or gamble, there's something about the bright lights, glitz, and glam that make casinos like Vegas and Seattle's Tulalip Resort Casino attractive. Thus, our Asia 2016 tour had to include a stopover in the Las Vegas of Asia: Macau (also spelled Macao). Indeed, more revenue from gambling is generated here than anywhere else in the world, reportedly seven times the revenue of Las Vegas, and many of the iconic Vegas hotels and casinos can also be found here. Walking through The Venetian in Macau really didn't feel that different from its Vegas counterpart; everything was the same, including the faux painted skies and gondola rides. But apart from similar aesthetics and designs, Macau has an entirely different vibe, and it's actually quite tough to compare it to Vegas. Some travelers might find this disappointing, but I found the surprising charm, character, and history of the former European colony to be fascinating. It's a place I'd love to return to someday and explore further. See more travel photos of Macau. Located on the continent of Asia, Macau is a dependent territory of China. 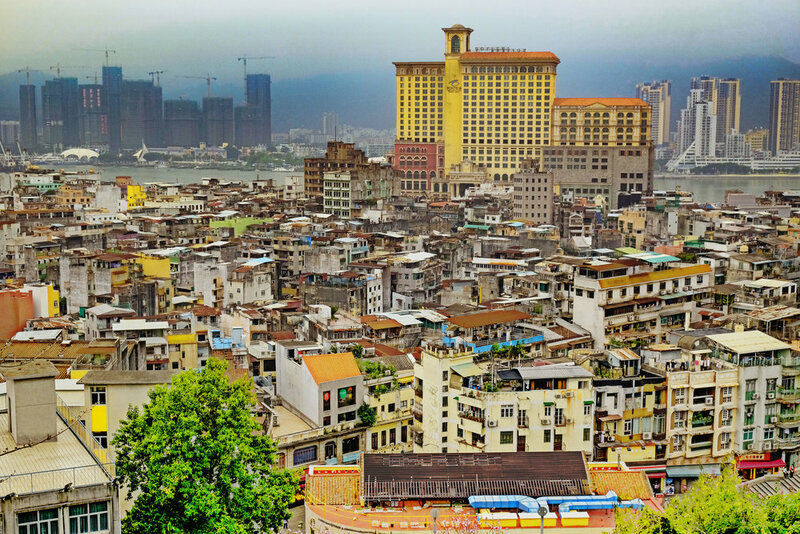 With a population of around 650,000 spread over an area of 11.8 square miles, Macau is considered the most densely populated region in the world. Despite the density, this region is also among the richest, thanks largely to being the world's largest gambling centers. Most visitors come to Macau as a day trip from Hong Kong. Thanks to its southern location, Macau has a very humid subtropical climate. Average humidity is generally around 75% to 90%. The warmest month of the year is July, where the average temperature is 84°F. Meanwhile, the coolest month is January where the climate can be as low as 58°F. The official currency is the Macanese pataca, which was first introduced in both Portuguese Macau and Portuguese Timor in 1984. Entering Macau is very easily done via a ferry from Hong Kong. Ferries from Hong Kong to Macau run 24 hours a day, at intervals of 15-30 minutes during the day and each hour at night. Thus, ferries are the easiest and most affordable ways to get into Macau. Economy class tickets on a modern Turbo Jet (with free Wi-Fi!) that will get you from Hong Kong to Macau in about an hour will cost around HKD 164 (~ $21USD), with ticket prices being slightly higher during the evening and on weekends.For many years, this was the main way for visitors to get in and out of the country. In recent times, however, direct flights have made it possible to fly directly into Macau. Upon arriving at the main ferry terminal in Macau, you'll then need to taxi or bus to your final destination, which will likely be one of two major entertainment zones in Macau. Many hotels and casinos provide free shuttle bus transportation. Even though Hong Kong and Macau are officially part of the People's Republic of China, both are designated as Special Administrative Regions (SAR), meaning that a Chinese visa is typically not required to enter either Hong Kong or Macau. This, of course, does depend on which passport you hold and how long you plan to stay, but it was not a problem for two Americans with a 2-day trip planned. Government regulations do not allow hostels to operate in Macau. As a result, it is is not an easy travel destination for backpackers and travelers on a budget. Luckily, you can easily afford a day trip to Macau from Hong Kong at the very least. In our case, we got extremely lucky and found a private, modern Airbnb apartment rental close to many of the attractions. Conveniently located across the street from the Emperor Palace Casino, the apartment was reasonably priced. But best of all, it had a walk-in bathroom that wasn't the size of a tiny closet. This was a big luxury after experiencing the cramped quarters of accommodations in Hong Kong. Still, it was pricey enough that we only planned for a two-night stay before heading back to Hong Kong. Our Airbnb was in the older Macau Peninsula area where the Grand Lisboa, Wynn Macau, and MGM Grand Macau were found. We spent the bulk of our first day debating about whether the shape of the Casino Lisboa's building was an onion or a pineapple (it's a lotus) and strolling through all of its surrounding casinos. Visually, casinos here trumped those of Las Vegas in terms of newness and overall impressive grandeur. They had a "no photos in the casinos" rule that was very strictly enforced, so there are no images for proof. But we saw some of the most impressive chandeliers and interior designs in the casinos. Many hotel lobbies were also very stunning, especially those of Galaxy Macau. There were also lots of impressive hotel shows such as the unveiling of a 24-carat golden Tree of Prosperity at the Wynn, and the 3-meter Fortune Diamond that rises from a waterfall at the Galaxy Macau. But for all of the grandeur and the incredibly spotless shine of Macau's casinos, it was severely lacking in the crazy, chaotic, "party all night" vibe that is only found in a place like Vegas. The reason was cultural appropriation. Definitely not a drinking society, don't expect to see the booze-fueled advertising behemoths and the enormous half-yard drinks that dominate Vegas. In fact, we actually struggled to find a lively bar serving any sort of alcohol in certain casinos in the Macau Peninsula. Instead, the throngs of older Chinese men and women crowding the baccarat tables (poker was nowhere in sight) were sipping hot water and tea. And while some women were scantily clad, there were no go-go dancers and streetside performers. Speaking of entertainment, there were very few advertisements for big-name performers and shows, so the typical Vegas-style entertainment factor was also missing. Take all of this away, and you have a place that looks like Las Vegas but hardly feels like it. In many ways, Macau is the antithesis of Sin City. Adding to the puzzling vibe was the observation that all luxury shops and malls were empty. Even the many upscale, Michelin-starred restaurants and casinos of Macau Peninsula were like eerie ghost towns. There were absolutely no patrons, yet each venue was fully staffed. This led to awkward moments as tuxedoed security guards warily eyed our camera bags, daring us to snap a photo so they could reprimand us. In the newer Cotai district, we finally found a much busier scene. There was a more normal flow of people going into casinos and shops, yet the high-end boutiques remained empty. Upon returning to Hong Kong, we reported our findings to our local friend who confirmed that the mainland Chinese have tightly reigned in their spending due to a corruption crackdown in which any obvious displays of wealth triggered an investigation over possible bribery and abuse of power. After leaving behind the strange casinos, we ventured into the "real streets." It was out here in the bustling city that we finally fell into our stride. This was the only country we visited in Asia this time around where we couldn't use English. Dining was particularly interesting as we pointed cluelessly menus we couldn't read, attempting to order food. Being robbed of our ability to communicate made our travels here feel the most exotic and authentic. While Macau isn't that large, it is very condensed and full of tall residential buildings and busy streets. Yet compared to Hong Kong, it was significantly less chaotic and more peaceful. Since it was once a colony of the Portuguese empire for over 400 years, Portuguese influence remains. Many of the buildings, especially in the old part of town, retain colonial architectural design. Street signs are in both Chinese and Portuguese. However, Cantonese is the most widely spoken language and it's questionable how many residents know any Portuguese language. All-in-all, two days was the perfect amount of time to spend in Macau. Our first day gave us time to stroll through the casinos to admire the glitzy, unique architecture that can't be found even in Las Vegas. And our second day let us explore the real streets and people of Macau. From a tourist perspective, there may not be many attractions or activities, especially if you've been to Las Vegas. However, experiencing Asia's version of Sin City is definitely worth a visit. Personally, I feel that our visit during the low season had an impact on our experience. It's strange to visit a place where tourist attractions are practically lifeless. I would love to return when it's full of more people. I'd also love to get a local tour guide's perspective of Macau. It possesses a mysterious charm that can't quite be cracked in just a two-day stay.